Cushions & Pillows — Circle Visual Inc.
Our custom cushions are unique and can be made in any size or fabric. The client can supply the fabric of his / her choice or may select from our wide range of fabrics. We create cushions to match your style and coordinate with your existing decor in any size or shape, including, L shape, round, lounge chairs, banquettes and more. Our cushions have a zipper and can be sewn with or without piping. Upholstery fabric is the best choice for cushions and both indoor and outdoor foam, as well as soft or firm padding is available. If your size is not listed, give us a call or send us an email and we'd be happy to provide a custom quote. We will estimate how many yards of fabric you will need to provide or purchase from us. Embroidery is also an option. Dimensions: 24" x 24" x 4"
Dimensions: 20" x 45" x 3"
Dimensions: 16" x 65" x 3"
Please contact us for custom sizes. We can make cushions in any thickness or size, for indoor or outdoor use. We can also add tufting and embroidery. 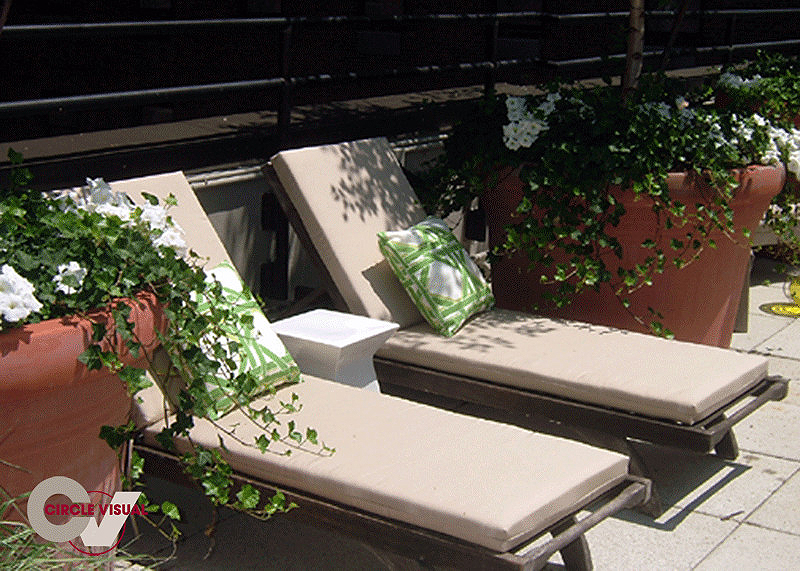 Our custom pillows are a great way to add more beauty to your yard and coordinate with your existing decor and style! They are custom made, which allows you to choose any fabric you want! You may choose from our wide selection or send us your own. Our pillows include a zipper, so they can be easily removed for cleaning and can come with a polyester insert. Down inserts are also available. We create them with and without piping. If your size is not listed, give us a call or send us an email and we'd be happy to provide a custom quote. We will estimate how many yards of fabric you will need to provide or purchase from us. Embroidery and tufting are also options. Call For Custom Sizes & Pricing Information. Shipping prices based on size and delivery.